The PREA Associate Member Program is about partnership. Associate Members play a key role in the success of electric cooperative organizations in Pennsylvania and New Jersey. By providing professional expertise in vital business and industry matters, Associate Members help cooperatives more effectively serve their membership. In today’s competitive environment, that partnership is more important than ever. PREA’s Associate Member Program is designed to help you make the most of that partnership. The membership benefits are structured to provide you with ease of access to cooperative activities – and cooperative decision-makers – so you can focus on forging bonds and building relationships. For your convenience, the PREA Associate Member Program has several levels of participation to suit your needs. Each level has benefits geared toward your level of engagement, whether you attend our various events or want to show your support for cooperative activities in other ways. 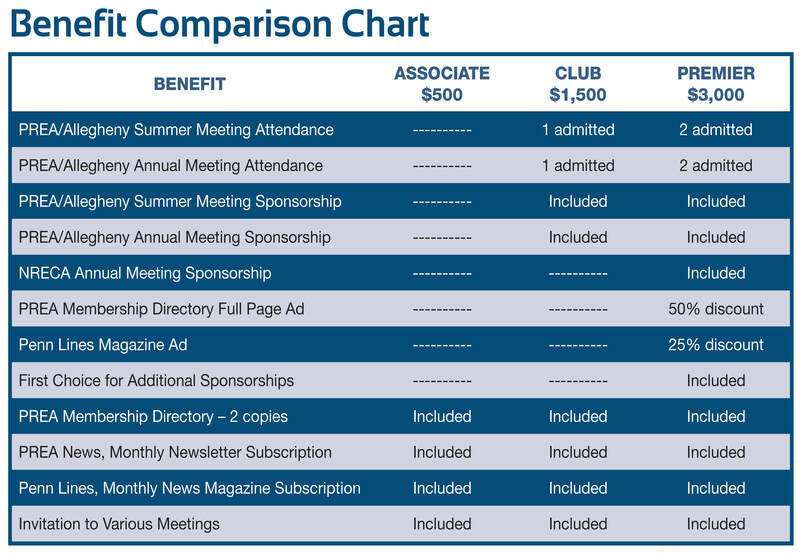 Please consult the chart below in choosing a membership level. We look forward to partnering with you. To download the application form, click here. For more information, please contact Kristin Bleiler at 717-233-5704, [email protected].